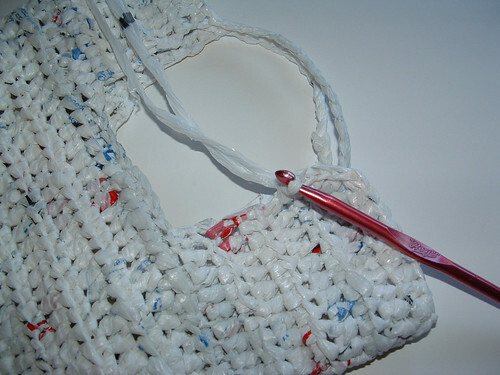 This post is going to show you how to use a dollar store purse for a plarn purse lining. This hack is a great way to use this cheap purse for a crocheted purse lining. Turn the dollar purse inside out so the colorful flowers are on the inside and it becomes a quick and easy purse lining. I crocheted two recycled plastic bag panels out of plarn using a J (6 mm) crochet hook. I worked increases and decreases with the plastic bag yarn to create a similar shape to the dollar store purse. Here is one panel as I began to crochet the opening for the purse handle and a closeup of the stitching around the opening. I just worked in a circle around the opening crocheting until I had a circular opening to match the dollar store purse. Put the two panels together and using a strand of plastic bag yarn, stitch down one side, across the bottom and back up to the top. Using a H (5mm) crochet hook, I added some novelty yarn to trim out the circular opening and along the top edge. 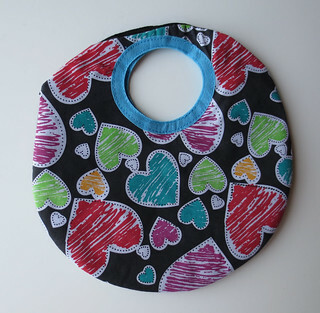 This completes the recycled plastic purse shell. © 2013 My Recycled Bags.com - Powered by Wordpress.